The modern city dwelling human often spends up to 3 hours in traffic sitting in their own car. Having snacks in the car, travelling with kids, driving through the dusty Indian roads and general wear and tear ends up making the inside of any car pretty dirty. Paid cleaning services are good but cost a pretty penny. A simple and efficient solution is to buy a high-quality car vacuum cleaner. What to Look for in a Car Vacuum Cleaner? 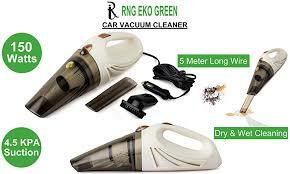 Car vacuum cleaners vary massively from household vacuum cleaners in terms of size, power source, capacity, weight and many other parameters. 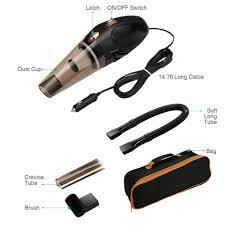 Following are some of the common points to watch out for when choosing a car vacuum cleaner. This is the most important thing to consider before you choose a vacuum cleaner. For SUVs and luxury sedans a larger heavy duty vacuum cleaner may do the trick but for your small family hatchback, you should choose a handheld bagless variant for ease of cleaning. Battery operated handheld cordless vacuums can reach every nook and cranny of your car, and they never need a power source. For the ease of use they sacrifice on the power which corded cleaners excel at. But they need a power source and due to the corded design they are much more cumbersome to clean each corner and under the seats. A car is a combination of various types of upholstery, devices, mats, carpets and other paraphernalia. The more attachments a vacuum cleaner has, the easier it is clean all of those crevices, nooks and crannies that are harder to reach. If you have kids or pets (some car owners can’ differentiate sometimes), then you definitely need a vacuum cleaner with a larger waste tank. But if your car does not get messed up as often and a weekly light dusting is sufficient, then a vacuum with a smaller tank should do the trick. 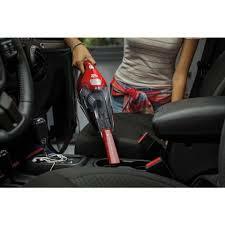 After all is said and done, budget plays a big role in choosing the correct car vacuum. We always look for the products that provide us with the best bang for our bucks. While comping this list, we have kept budget as one of the key factors. The international Dirt Devil brand is now in India and it brings the strong heavy duty SD2005Red which can such out even the toughest dirt and grit with its powerful 7-amp motor. With a 16 feet long cord, compact portable design and large enough dust tank, it is the perfect marriage of all that you need in a car vacuum cleaner. Despite its quality, the SD2005Red is still affordably priced. The cleaner comes with 3 attachments. 16 feet long cord makes it easier to clean all corners. Upholding the heritage of quality German engineering, the Bergmann Supersonic is an amazing product for all types of cars and dirt. Its 15 feet long cable ensures easy reach to any part of the car and 27,000 rpm motor boasts of one of the strongest suctions in the market. A transparent dust tank lets you know when the tank is full. 3 stage HEPA, mesh and exhaust filtering mean you get the cleanest car every time. Perfect of all car sizes. The cord is detachable making it easy to carry and store. Comes with just 2 attachments. The IGRID BL1010 is a marvel of modern patented technology that can such your car dust problem away. 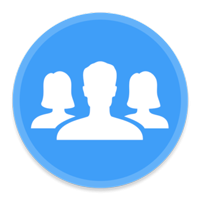 The triple cyclone filtration and HEPA filter means even dust as small as 0.3 microns cannot escape its mighty suction. Washable HEPA filter means the motor remains healthy for longer. 4-meter-long cord makes reaching most parts of the car easy. The vacuum cleaner comes with a transparent dust tank so you can always keep an eye on when it is full. The cord could be slightly longer. Warranty and post-sale service a concern. Simple, easy-to-use and effective, the Black & Decker AV1205 Grey is a perfect choice for people looking for perfect balance between power and price. With its twin action filtration, the AV1205 can get rid of the clingiest of dirt and grit. A 5 meter cord ensures easy reach within the vehicle and brush and crevice attachments allow you to clean every part of the car. The 550 ml dust tank holds good for multiple cleaning sessions. 12 V DC with 5 meter long cable. Comes with only two attachments. After sales service is questionable. Low suction power at 12.5 watts. 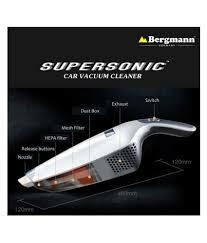 A popular name in the Indian cleaning industry, Eureka Forbes’ take on car vacuum cleaners is not shoddy either. It has a very high suction power which allows it to handle all types of dry waste with ease. Single release dust cap button is perfect to clean up the machine once it fills up. The 5 meter long card should be enough to clean any type of car from hatchbacks to sedans. Powerful suction at 100 watts. Trusted Eureka Forbes brand name. Comes with only 2 attachments. Company advice only 15 minutes of run time. The above list is just our take on the best car vacuum cleaners available in India by carefully weighing the most important parameters we have mentioned before. Each of these machines can handle a hatchback as easily as it can handle an SUV. Their suction power, filtration and ease of use puts them at a cut above the rest. Any of these could be the perfect product for you or it could be something else. In this day and age of the internet, the best car vacuum cleaner for you is just a few clicks away. Make sure you choose the right product for your car and do not forget to clean your car regularly. All the best!